MeldaProduction has announced the five plugins to be discounted this week as part of their 2016 Eternal Madness discount. For the whole of January, Fwpansion is having a special Winter sale with 50% off several expansions for BFD and Geist. Rhythmic Robot has released its new virtual drum machine for Kontakt Regal Rhythm, and currently offers it free for any purchase. 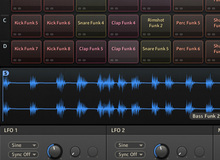 Image Line announces the update of its Groove Machine Mobile drum synth app for iOS and Android and the beta release of the VST version. Native Instruments announces the release of v1.1 update for its Polyplex virtual synthesizer, as well as a free expansion pack from Twisted Tools. This week, MeldaProduction offers a 50% discount off five plug-ins, including the MDrummer Large virtual drums. FXpansion did not wait until Black Friday to launch its promotion period, which runs until December 31st.